What do we think of when we hear the words, ‘con’, ‘fraud’ and ‘lies’? Correct! The Federal Reserve Bank. The Chairman, Mr. Bernanke, paddled across the river Styx to address the nation over which he rules on Thursday, September 19, 2013. Since he and his associates had so clearly intimated over the last several months a reduction in the $85 billion per month bond purchase program known as ‘quantitative easing forever’, nearly everyone anticipated, and expected, an announcement of some reduction in the amount of those purchases. But alas, there was no such reduction. The Fed elected to keep the current rate of purchases in place until they were more comfortable with real signs of economic recovery. 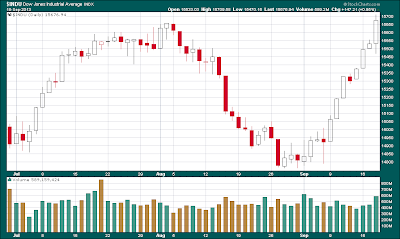 How did the stock indexes respond? Of course, they went straight up. Welcome to the con. As anyone with a functioning brain cell knows, the economy is precariously weak and does not support rising stock prices. Sure, the top 5% of wealthiest Americans have recovered quite nicely from the recession while the bottom 95% are still losing ground. The housing market is distorted by foreign purchases, hedge fund purchases, and foreclosed sales. Not to mention, the supposed ‘shortage’ of inventory that the con men talk about surely doesn’t include all the abandoned homes throughout the nation that are not officially ‘on the market’. As far as employment, it is clear that workers continue to lose ground as all the supposed new jobs ‘created’ are part-time and the rest are conjured from the ‘birth-death’ ratio in which the BLS simply invents jobs to make the number look pretty. As such, the Fed has to maintain the scam until they finish stealing all the assets of the US Treasury right out from under the noses of the profoundly ignorant american public. The Fed does this by driving up the stock indexes because many people still stupidly believe that the Dow Jones Industrial average is a barometer of economic activity. Nothing, and I mean nothing, could be any stupider! The Dow is nothing more than a Trojan Horse. Witness, the Fed elected to maintain their current $85 billion in asset purchases because the economy in their view was still too weak to operate without a constant influx of monetary steroids. So, the Dow rallied nearly 200 points from its low of the day based on the idea that the economy was weak? What? No, the Dow does not move based on the economy. It moves because the Federal Reserve Bank moves it. Period! Their announcement on Wednesday surprised the investment world in part, because the Fed had led everyone to believe they were going to curtail asset purchases because the same Fed had said several times in the previous month that the economic numbers were getting strong enough to do so. Again, the Dow rallied because the Fed will keep injecting steroids and not because the economy is getting better. Witness, the first chart below shows the Dow since the beginning of July. Since the Dow was making new all-time highs, the Fed began to feel confident that they could introduce talk of asset purchase reduction. The Dow crumbled in August. Obviously, the economy is still in real recession and cannot stand without chemical help in the form of Fed stimulus. Uh-oh!. If the downward trajectory of the Dow continued into September, investors would then get a quarterly portfolio statement in October showing a decline in stock valuation for the quarter. Then, even the dumbest american would begin to question the notion of ‘economic recovery’. Was it a surprise to anyone that the Fed went to work immediately at the very beginning of September so everyone’s third quarter portfolio statement would show a gain? Just to lock in that gain, the Fed elected to keep asset purchases at $85 billion. Surprise! Stocks rallied again! And yes, Abe Lincoln was wrong. You can fool all of the people all of the time. All you need is control over the stock indexes. The chart below shows the con in all its splendor. 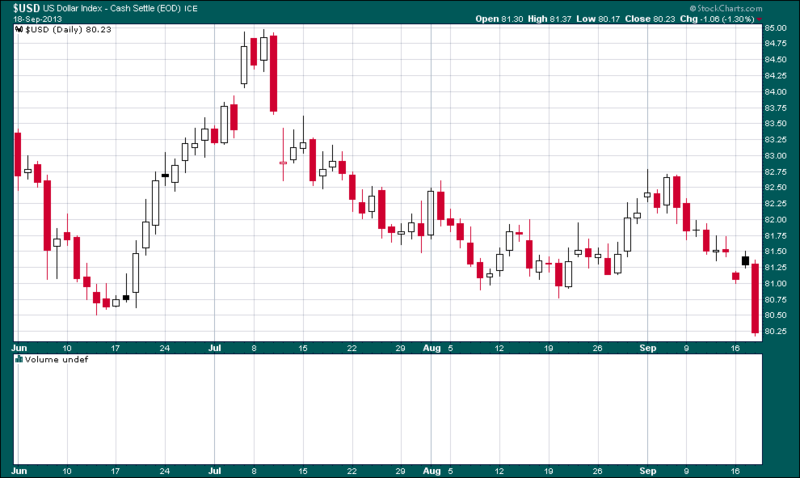 The following chart is a chart of the US dollar as represented by the USD. In my lecture from last year, I outlined why the USD would rise to about 87 and then roll over. It made it to about 85 and then the Fed started their ‘taper’ talk. To be clear, the Federal Reserve Bank has a singular goal. That is, they are a foreign private bank (yes, they have argued this point in the Supreme Court and won) with the goal of acquiring the assets of the US Treasury, over-throwing the US system of governance and sovereignty, and enslaving the unsuspecting populace. Check, check, and check. As long as the Dow keeps rising, no one cares and no one suspects a thing. That oat sack that is slung over our ears completely distracts us from the yoke that is getting locked in place over our shoulders. Witness, at $85 billion dollars per month injected into the economic system of the US, the yearly tally is over a trillion. In other words, the Federal Reserve Bank is injecting the equivalent of 6% or so of the entire GDP of the entire country. In other words, take away that 6% injection and GDP would shrink by 4%! That my friends, is…, well…, Greek-like! What’s the difference between the US and Greece? No one is injecting 6% of Greece’s GDP into their economy. Witness, all the nitwits that gather to question Mr. Bernanke at his post-con news conference. Not a single nitwit asked the most important question of the day. Mr. Bernanke, where does your foreign-owned for profit private bank get $85 billion US dollars per month to use to buy US assets? The answer is of course that they steal it. The Fed simply commands that the US Treasury hand it over. The US Treasury complies because, well people like Nancy Pelosi and John Boehner are guarding the printing press, and, they can’t refuse else we all have to face the truth. Heh, come on back. I didn’t mean to scare anyone with that ‘truth’ word. Sorry. This is amurika. I’m not sure if any of us are allowed to speak the truth anymore but I’m going to risk it. The point is this. Everyday the Fed buys assets, it buys assets with our money. That’s called stealing. This is also known as fraud. Why should the Fed discontinue their thievery? After all, they have now piled up over $3 trillion in US assets and before long they will have $4 trillion. The chart below show the effect of this thievery on the US currency. As the Fed has done since its inception, they continue to devalue the currency and destroy the purchasing power of the suckers holding this paper. The last day on the chart shows clearly that the currency took yet another huge drop courtesy of Mr. Bernanke’s announcement. This dovetails nicely with the con of driving up the stock indices as a weaker currency inflates asset prices for things like the Dow. Everything that comes from the Fed is a lie including the Federal Reserve Notes they pass off as ‘money’. But let’s look at one big fat lie. Witness, Mr. Bernanke said in his press conference that the Fed conducted its operation to help the average citizen. Sure, he acknowledged helping his big bankster friends get richer but he was also concerned about helping the people on the lower end of the economic scale as well. You know, that would be the 95% of the populace that still can’t find an extra slice of bread to eat. The following chart is a chart of the price of gasoline. Poor people that are lucky enough to have a job of some kind go to work and have to pay for gasoline to get there. Look at the effect of the Fed’s decision on gasoline. 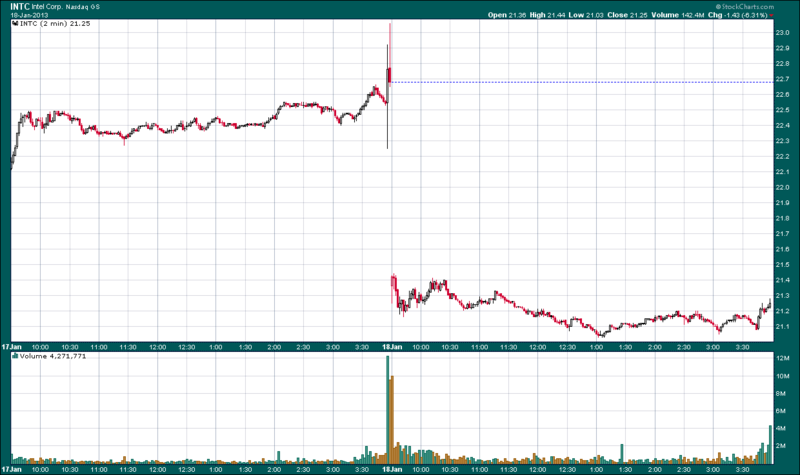 The final trading day on this chart shows a quick spike higher in price. Oh goody! Thank you Mr. Bernanke for looking out for us poor people. Thank you for making gasoline prices rise. (The big spike at the end August was no doubt due to the alleged gas attack in Syria.) Yes, weaker dollars inflate prices in stocks and gasoline. Mr. Bernanke simply chooses to lie about the Fed’s real intent. They are not helping the poor people. They are killing the poor people. Witness, some argue that holding down interest rates help poor people. Interest rates only play a part in housing and autos and those purchases are by choice. Food and gasoline are not purchases by choice. Witness, Mr. Bernanke taught economics before he joined the Fed. Apparently, everything that he taught his students was a lie because the man obviously does not believe a single word in any economics book that he used. Why would anyone waste a dime to take a course that this man teaches? His answer to everything economic is the same. Steal money from the US Treasury and throw money at the problem. There - I just surmised everything that Mr. Bernanke knows about economics. Maybe I should teach economics too. It’s easy. We have been reduced to the con, the fraud, and the lie. I know, I know. Like me, readers need a few moments to compose themselves after a hearty tear-inducing belly laugh. But really, let’s break it down. First, Elmer, or Mr. Fisher, says that ‘some’ market participants are accustomed to a Fed ‘put’. Please, sir, put the drugs down for a minute. Let’s change that to ‘all’. Then he says, ‘idea’ concerning the Fed ‘put’. Please, this is no ‘idea’. It is fact. The Dow drops. The Fed acts. Show us an single instance in the previous two decades in which this has not been the case. Then, this guy admits that the Fed has been ‘levitating’ the stock indices. This means there is nothing but air underneath stock prices. This is called a ‘bubble’. Of course, we would all agree that the Fed’s activities do indeed ‘distort’ asset prices. But this is what the Fed does. Why? Because it’s good for banks! Now, Mr. Fisher thinks that the Fed should begin to curtail bond purchases this fall. If this guy thinks for one second that the Fed can do this without a Dow plummet, he is out of his mind! If he thinks the Fed will not respond to such a plummet by yet another intervention program, then he is deranged. Let the Fed announce some degree of ‘tapering’ of bond purchases. Watch the Dow plummet a few thousand points. I would suggest that Mr. Fisher have a large shovel handy because he will need it to clean a substance from his underpants of which he is full of. The Fed has continuously demonstrated that the stock indices will not be allowed to contract substantially. Should they, and the game is over. Then even the dopes will realize the sham perpetrated by the central bankers. It is indeed the public speeches by members of this cartoonish body that should alert us as to the disaster that awaits us somewhere at the end of the tunnel. I believe the Fed will write the economic news that is necessary to warrant tapering sometime this fall. The Dow will then plummet like it was 2008 all over again. Then the Fed will clean our their pants and announce an increase to bond purchasing thus driving interest rates to new all-time lows and the stock indices to new all-time highs. Like Elmer, the Fed might go wabbit hunting but they ain’t gonna shoot no wabbit! Just one more thing. Copper has long been thought of as an economic barometer. What is it telling us now? 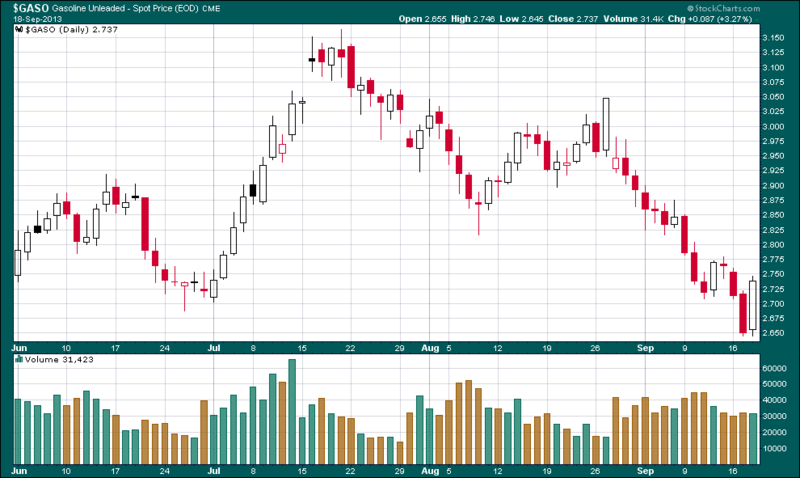 Below is a chart of copper, the Dow, and the US dollar represented by the USD. This is an eleven-year, weekly chart with the price of copper in orange, the Dow in blue, and the USD in green. Very simply, we can see that the price of copper has for the most part tracked the Dow. And, we can see that copper and the dollar have been mostly inverse in their movement. 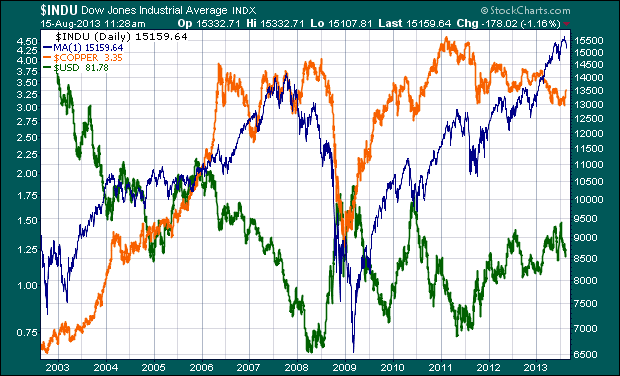 So, we can now see that really since the beginning of 2011, copper has been declining and the Dow has been ascending. This year, this has become even more apparent. 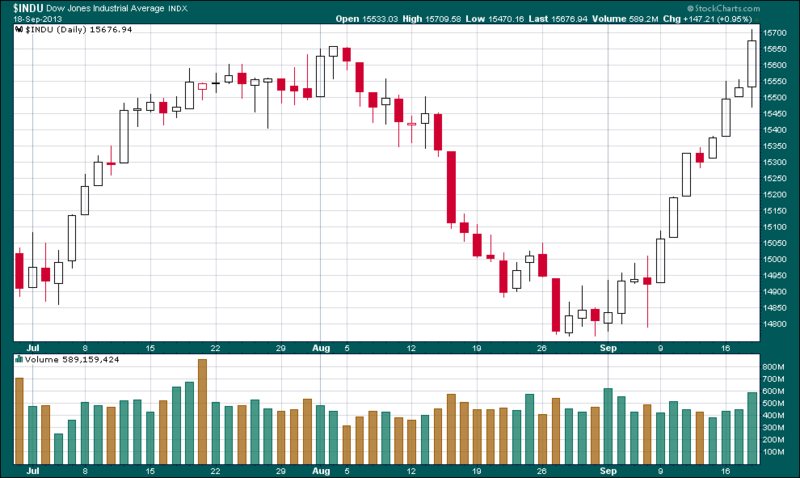 Most likely, copper falling and the Dow rising cannot continue. One must join the other. For copper to rise, and thus affirm a Dow rally, the dollar must fall. Home construction and the like would have to increase to drive copper higher but I think we all know that to be fantasy. That will simply not happen with higher interest rates. 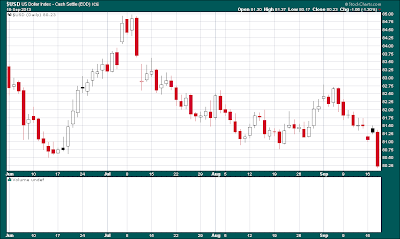 Besides, copper is drawing a bearish head-and-shoulders and a long-term double top. Stock investors are always the last to catch on mainly because they want to believe all the lies of the regime. But what if the Fed tapers? The dollar would likely rally, copper would fall, and the Dow would then have to make a decision. The recent Dow sell-off would tend to support the argument that the Dow will follow copper lower. I believe it would join copper in a descent until the Fed reverses course and once again, increases bond purchases. Do I hear an even $100 billion a month? Regardless, ignore copper at your own risk! Question: What drives stock prices higher? The Dow was up 140 points. Question: Where will the Dow go from here? Answer: Where ever the Federal Reserve wants it to go. Question: When it comes to stock prices, does anything else matter other than the Federal Reserve? Question: Does anyone know anything? Answer: No. UPS carries packages of goods that are bought and delivered throughout the US. They said sales and earnings were a bit lower due to a weakening economy. JP Morgan makes money by stealing it from americans and using it to make money from insider trading supplied by the Fed. They said earnings were good because of a strengthening economy. Corporate health in the US depends upon which side of the river Styx they reside. Texas Governor Rick Perry participated in a presidential candidate debate last year and couldn’t remember three things that he was supposedly for. He turned to the camera with that ‘deer in the headlights’ look and said, “Whoops!” Intellectually overpowered by the other mental midgets on stage, Mr. Perry went back to Texas to govern the citizens of the state. He, and his state, are now the face of american ignorance. The state of Texas is taking on the issue of abortion. A reported group of several thousand are rallying in protest of more restrictions to abortion rights. Their picture gave me the motivation to write this piece. I feel for them. Woefully ignorant. Intellectually stupefied. Incarcerated by their patriotism. Completely deceived by their belief in a political system. Arguing over an apple while standing amidst an orchard. This is the face of america. Mr. Perry is leading the fight to restrict abortions in Texas. For his part, he believes he is doing what he was elected to do. He said in part, “...value life and want to protect women and the unborn”. Seriously? Texas just executed the state’s 500 person last week. That person was a 52-year old woman convicted in a Texas court of murder. Texas also leads the world in wrongful executions. Here lies the apple in the orchard. The founding fathers who wrote the Declaration of Independence for America realized that government was and is, simply bad. Therefore, the best government is one that is put in a box and kept there forever. Why? Governments are by nature deleterious. If government is allowed to do one thing, they will then do a second. And then a third. And so on. Pretty soon the governed are shackled and punished by stupid laws written by people with names like Bush, Obama, Pelosi, Frank, Perry, and on, and on, and on. As we approach america’s ‘independence day’, we should all try to think of what it is that we are independent from. Our elected leaders surrendered america to a bunch of mendacious and vile banksters in 2007 giving them free reign to do anything they wanted as long as they made the Dow Jones Industrial average rise. 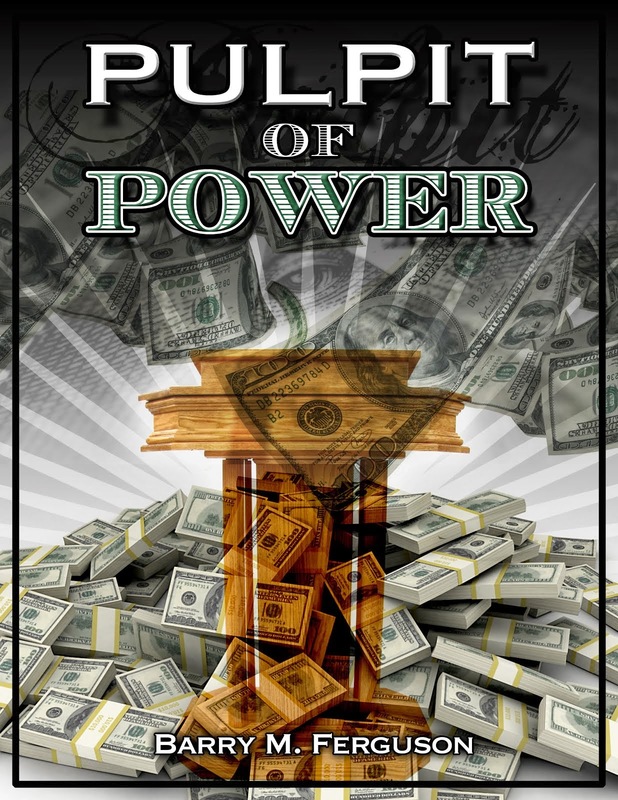 Unelected power mercenaries like Paulson and Bernanke seized the moment to dupe the profoundly ignorant elected leaders into giving up control of their country. Once the banksters seized control, all control was lost. Liberty was crushed. But the Dow rose. Isn’t that all that matters? Now look at the world on July 1, 2013. It seems like every country on the planet is experiencing riots and demonstrations. It all comes back to the same thing. There is too much government and too much government control. It’s a slow process but eventually the average citizen begins to realize that something has gone wrong. Somehow, the government is making all the personal decisions that the geniuses of liberty sought to exclude from government discretion. In Brazil, the supposed economic miracle has proven to be just another balloon that was expanded on the gas of other peoples’ money. When that money ran out, the balloon popped. The government started a power grab in an effort to generate more money to keep the government going. They raised gasoline prices and so on. Finally they raised bus fairs by nine cents and the camel’s back was broken. Citizens poured into the streets finally in protest. Every nation that is experiencing unrest in the streets has brought on that unrest by exerting too much control over peoples’ lives. Eventually, people get tired of it and rebel. The trick is to not allow government any power. For goodness sakes, I wouldn’t even want an incompetent dope like pelosi filling up my gas tank - much less voting for destructive legislation that she hadn’t even taken the time to read. Suffice to say, as long as the legislation was crafted by someone with a ‘D’ behind their name, she is for it! Now Mr. Perry wants to kill some people while at the same time, he wants us to think he values life. This isn’t really about life or punishment for crime. This is about governmental control. Why is it anybody’s business what a woman discusses with her doctor? Why is it anybody’s business what a woman does in her choice of reproduction? Why are my phone calls and emails listened to and read by the US regime? Why is it the responsibility of the central bank to determine the correct price of IBM stock or the correct price of a US Treasury bond? The point is, until these pathetically ignorant people demonstrating outside an Austin, Texas Capitol building understand the importance of the orchard, they will never understand the value of a single apple. We, the people, should control the orchard and not the regime. If the regime controls the orchard, then they control every single apple. It is our money, we, the people, that funds the government. We should not allow them under any circumstances to become a regime and lord over the orchard. Once we allow them to frisk us at an airport, then they can frisk us anywhere. Once we allow the regime to listen to a single phone call without due process of law, then they can listen to any other phone call they choose. Our liberty is only as good as the liberty of our neighbor. If we can tell our neighbor what to do, then our neighbor can tell us what to do. Then, none of us have liberty. Once a member of a political party is convinced their party is superior over another political party, we have established a society of elitism. Once a member of a party is allowed to use legislation to mandate morality over other people, we have established a society of restrictiveness. Once we cede control over economics and capitalism, we have opened Pandora’s box. She may make us feel good initially, but the end result is we will eventually find ourselves in that same box. We should celebrate the genius of our founding fathers like Jefferson, Morris, and Madison. But we should not be fooled by the faux patriotism of cloth and song. We should stand up and join arms in our own revolution. In 1776, our forefathers knew their enemy. Their revolution had a focus. The problem is today, the ignorant populace of the US hasn’t a clue. The banksters have managed to distract the hungry by arguing over an apple while they stand in the midst of an orchard. Whoops! Buried in the massive dung pile of preposterously positive US regime propaganda pertaining to the perverse presentation of economic data over the past few weeks were a few important items. One, Wal-Mart’s Jerry Murray, Vice-President of finance and logistics, said that sales for February (month-to-date as of 2/15/13) were a “total disaster”. He went on to say that this was the worst start to a month he had seen in his 7-year tenure with the company. For perspective, Wal-Mart sells more than the next several biggest retailers put together. So, when Wal-Mart sales are slow, we should infer that general retail sales are poor. This could be especially true when sales are worse than the years 2007, 2008, 2009, and so on. Of course, the ‘total disaster’ was conspicuously omitted from so-called ‘news agencies’. Maybe that’s because the regime just reported consumer confidence rising to bubblicious levels. Maybe over confident consumers bought their goods from higher end retailers. Maybe everything that the regime says is a bald-faced complete lie! Clearly it is passed time to consider a regime change in the US. We are grown-ups. We can face the truth. The truth is the current regime is a complete farce. To exemplify what a farce the current regime is, a friend of mine is a business owner and he had a surgical procedure done that required him to miss some time at his business. I told him not to worry as our regime leader has told us, that ‘we didn’t build our businesses’. I assumed that the regime would send someone out to take over for my friend while he recovered. Turns out, no one from the gooberment showed up. Thus, we have another example of a condescending lie coming from the regime. The truth is the regime lies about literally everything. Two, three of the biggest four economies in the world, the US, the EU, and Japan, reported negative fourth quarter GDP. China remains in positive GDP territory but who really knows? The regime wants us all to believe that everything has ‘bottomed’. Manufacturing and durable goods have picked up. Jobless claims are down. Consumers are positive. Unemployment is falling. Exporters are exporting and consumers are spending. Well, at least they are not spending at Wal-Mart. Well, in reality consumers aren’t really spending at all since most leading economies are in negative GDP territory. Europe, in fact, is getting worse economically unless we are to believe the liars in charge of asset confiscation. The truth is that world economics is still a mess. Three, the US regime claims to see signs of an economic revival due to the pickup in spending in the aftermath of Hurricane Sandy. Really? Allow me to inject some sanity and intelligence here. If I were to wreck my car, I would have to buy a new one. Yes, a car dealer would get some extra business and a car manufacturer would sell a unit. But now I would be poorer due to the price of the new car. I would argue that this is an economic wash. Or, perhaps this is actually a negative as the new car would cost more than my old car in both price (due to inflation) and taxes. Yet, regimes count the rebuilding of property as only a positive. What about the negative of increased expenses due to the losses? No, regimes don’t count losses. Therefore, everything is a positive. Maybe we should simply bulldoze every city in the nation at the end of every year. Maybe I should wreck my car every day. Imagine what GDP growth would look like then! Thus we should conclude that the truth is that economic data reported to the public is absolutely preposterous. Finally, we turn to the chart to see modern economics in action. 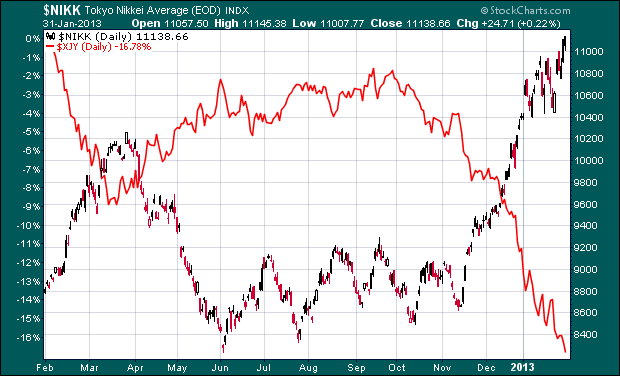 The chart below is the Japanese yen in red and the Nikkei Average in candlestick over the last year. The Japanese GDP has turned negative in the previous quarter so the central bank of Japan has embarked on the accepted cure-all strategy for economic revival. That is, currency devaluation. Everybody’s doing it. From the US to Venezuela to Zimbabwe to Japan. Every central banker in the world is now engaged in currency devaluation. Has this strategy ever really worked? No, not really. Did Bernanke teach this to his students at Princeton when he taught economics? The reasoning is fairly simple. When economic growth contracts, devalue the currency of that economy. If a gallon of gasoline costs $3.00, then devalue the currency by 33% and now the gallon of gasoline costs $4.00 dollars. Then sit back and watch consumer spending go up producing positive GDP. Of course these same bankers must follow through with the sham by ‘adjusting’ the formulas that calculate inflation such that none of that appears. That way the stupid people that live in the kingdom won’t complain too much about rising prices. The regime’s fuhrer might then want to impose higher minimum wages on the businesses of the kingdom to further placate the woefully ignorant populace. But most importantly, devalued currency inflates stock prices. Yippee!! Slow economies can easily be transformed into robust economies. Study the chart below. Is there any coincidence that since October of 2012 the yen has lost about 15% while the Nikkei has gained about 15%? We must therefore conclude that the Nikkei stock average has not gained anything. It was merely inflated 15% by the currency devaluation. Inflation is not ‘appreciation’ nor is inflation a builder of affluence. Stock indices have now become a weapon of deceit fired from the cannons of central bankers in a effort to subdue us and confiscate our assets. This is simply a presentation of the truth. The New Year and the month of January are off to good starts as evidenced by stock index gains so far. Since all stock indices now are products of manipulation and not valuation, we owe a big ‘thank you’ to whomever the key manipulator might be. At this point in the year, that manipulator would be the Japanese central bank the BOJ. They announced a new ‘Zimbabwe’ style strategy to boost their listless economy. The BOJ is going to devalue the Japanese yen and they are going to do so by selling yen and buying other currencies. Given that they need Europe to buy their products, the BOJ is specifically going to buy euros and euro debt. Currencies are not valued in vacuums. Their value is relative to the value of other currencies. Devaluing a currency necessitates the selling of that currency and the purchase of another currency. The BOJ strategy will devalue the yen and raise the value of the currency they buy. What if they picked the US dollar to purchase? That would have appreciated the dollar and of course since the Dow is nothing more than a product of US dollar currency depreciation and thus inflation, the stock index would have crashed. Instead, Japan needs Europe to buy Japanese products. Of course, Europe is drowning in debt. So, the BOJ announced they would consume a great percentage of that debt by selling yen and purchasing the euros necessary to buy that debt. That makes the euro increase in value and the US dollar decrease in value. Since US indices are now simply inflated or deflated by manipulation programs, the falling dollar inflates stock prices higher. So to the BOJ and the Japanese people, we should spell out a big ‘Thank You’ in chemtrails over their skies. Or, in a more respectful ‘thank you’, we should use the Japanese words for ‘thank you very much’ - arigato gozaimasu. But hey, don’t get too excited. Almost all indices have risen since the BOJ took the lead in currency manipulation. 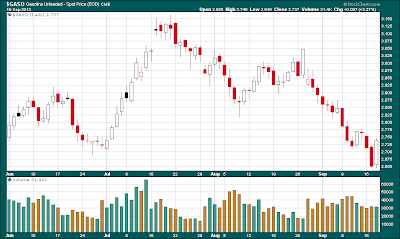 The chart below shows the S&P 500 in the black line and the Spanish ETF, EWP in candlestick. They, like almost all other indices in the world, are both up about 5% at the close on Friday, January 25, 2013. Just look at the chart below but keep in mind a few thoughts. One, when the world gets flooded with money, garbage floats like everything else. And, everything tends to float at the same water level. Two, Spain’s unemployment level is 25% and the under 25 year old unemployment rate is over 50%. Spain’s most powerful economic region, Catalonia, is mulling succession. Spain used to lead the world in home ownership. Most of that was based on adjustable rate mortgages. Their real estate continues to worsen as Spain’s largest bank, Bankia, declared what I interpret as a de facto bankruptcy in that they asked for government bailouts. Bad loans continue to mount. Does any of this matter? Absolutely not. In this new era of central banker manipulation, Spain, Greece, and probably Zimbabwe go up with everything else. It’s not about stock selection. It’s not about allocation. Making money these days is all about trusting central bankers to bailout the stock indices. That has been their pledge. Three, the world has entered another seductive bubble. Like all bubbles, it will eventually pop and ruin those who have been seduced. It is important that we recognize this period as a bubble. However, a lot of money can be made in a bubble and my guess is the central bankers are almost playing chicken with each other to see who can blow the bubble bigger. Four, the bubble keeps expanding on devalued money. Who would have known that the way to fix any broken economy is to devalue the currency? After all, that is the current strategy of every central bank on Earth. Zimbabwe took the lead with this strategy and look what it has done for them! Five, where do central bankers get the money to manipulate stock indices? Well, they simply steal it from the ignorant populaces and then give some of it to their banker pals. Where, for instance, did the Federal Reserve get $3 trillion dollars to buy $3 trillion dollars worth of US assets? Yes, I know they had the money printed. Where did it come from? The answer is to go stand in front of a mirror. While readers are there, they might as well assume the position and hold their hands up in the air. Brace yourself for the truth because this is possibly the only source on the planet. Printed money is debt. After all, it says so right on the currency. Our money is a ‘Federal Reserve Note’. That’s debt. Who pays for the debt? Citizens do with higher taxation. In order for the evil Fed to confiscate all of our assets, they must hopelessly indebt us. Enter their conspirators or what we call ‘Congress’. We are now all alone. Six, on a short term basis, almost all markets look to be a bit over-bought. They are due for some selling but there is no need to panic. The central bankers will be there to back stop the falling indices. There is no question in my mind that Ben Bernanke is not going to stop until the Dow at least makes new all-time highs. Yes, we may have a brief period of selling as we turn the calendar to February. Remember, Ben seeks to fluff up the monthly brokerage statements so we all go out and spend our money. He will make sure to keep January strong but then will take a break in early February. Hey, pushing up the stock markets of the world is a tiring task. But fortunately, Bernanke has help from his central banker brethren in Japan. Who will manipulate the indices higher in February? I don’t know. Let’s just enjoy January and give a loud shout out to Japan. Arigato gozaimasu indeed!! Before we close, let’s remember that US fourth quarter GDP contracted slightly. This is the latest from the National Department of Pathological Lying. Some people still refer to them as the Commerce Department but I think my title is a bit more applicable. This department is an extension of the regimes propaganda machine and their reports are always comical. For instance, they tried to sooth investors by trying to play off the entire drop on a decrease in government spending. They tried to reduce worries by including a few lines about business spending rising 12% due to software and equipment increases. Really? The same report says that business inventory build slowed greatly. What did they need the equipment for? Further, if businesses increased their software spending, it certainly was not reflected in the reports from tech companies that reported earnings recently like Intel, Microsoft, HP, Dell, and every other tech and software company. Well, we are talking about the gooberment propagandist. But worry not, my friends. Ben Bernanke does not need an economy to support higher stock prices. He has our money. He does not need corporate earnings to support higher stock prices. The Fed sets all prices for everything asset related anyway. He does not need the plunging consumer confidence to support higher stock prices. Stock ownership is declining amongst citizens so fewer and fewer citizens actually own stocks anyway. No, all Bernanke needs is an ever lower value of the US dollar. For that, we can say, ‘Arigato gozaimusu’ indeed! For stock investors, a new year brings hopes for capital gains. The US government is hoping for capital gains so they can generate more taxation. Central bankers just see the new year as more opportunity to manipulate the stock price higher so investors stay happy, the US government gets more tax money, and the average person on the street stays blissfully ignorant of the new elite order that dominates their lives. Same story, same worries, same stock game. Push the Dow higher and no one will question the price to be paid for that push. Except for me. The fourth quarter of 2012 was a downer so the Fed saw to it to get the new year started with a bang. The Dow leapt 200 points in the first few moments of trading on the first trading day of the New Year. This was not a surprise. The economic data that the government puts out would justify a stock price rally. Home sales and prices are improving, unemployment is falling, bankers are richer than ever, and the fiscal cliff was averted by a tax increase. Yippee! Everything is great again! Well, except that the US has again run out of money and needs to borrow another trillion to pay her debts. Congress remains completely infested with mental midgets of mendacious motivation. They answer every challenge with tax increases. They fill their constituents with fallacious blabber. They continue to destroy the country from the inside out with each stroke of their profanely stupid legislative pen. So to keep the oafs in line, the Fed has to work their black magic by pushing higher the ultimate barometer of economic deception - the Dow Jones Industrials. 2013 will no doubt be another superior year for stocks. Mr. Bernanke will see to it. Meanwhile, the assets of the US continue to be stolen from under the ignorant noses of the populace. For instance, a solution to the debt ceiling was bantered about in that the Treasury could issue a trillion dollar coin, give it to the Fed, and they could buy a trillion in debt. Say what? No one on the planet raised this question but me. But here is what we should realize. The Fed is once again in the equation as the buyer of US debt. With what are they buying the debt? Their own money? Ha! Don’t be preposterous. No one on the planet wants to buy US debt yielding 2% or less with their own money. The country is broke. There is no way it will ever repay the current $17 trillion in debt. And, the Treasury is in a race with the rest of the world to devalue its currency so whatever debt it does repay is with cheaper dollars. So, the Fed has to buy the US debt to keep interest rates down. Clearly, higher rates would put an end to the Fed con game and the rigged stock indexes. Most assuredly, the faux economic recovery would vaporize with higher rates. So at the end of the day, should this option come to fruition, the citizens of the country would be another trillion in debt, the Fed would have another trillion in assets that it did not pay for, and the idiots of the world would cheer the rally in stocks. The Federal Reserve currently has $3 trillion of assets on their books. Did they pay for any of it with their own money? Of course not. That used to be called ‘stealing’. Not when the Fed does it. It is called stimulus. This behavior will continue. There is no political intellect available to stop it. But, this will aid the stock indexes. Yippee! Get on board or get destroyed. The word of the new era is ‘manipulation’. There aren’t any real ‘markets’ any more. We are not allowed to set our own prices for anything - stocks, bonds, nothing. I call the current era the ‘Age of Insanity’. One reason is the manipulation and influence from the hands of the central bankers. For instance, every central banker on the planet is printing currency, manifesting electronic currency, and ballooning the money supply of their country of dominance. Who would have known? This is one for future economic books. Apparently, the way to fix an economy is to destroy the value of the currency used in that economy. How about that? But again, please remember the real reason for increasing the monetary supply. GDP equals money velocity times money supply. Money velocity is the turnover rate of currency as it buys goods and services during a year. Money velocity across the world is at all-time lows. That means that the true state of economics is lousy. A low money velocity rate would also serve to lower GDP. Uh-oh! Falling GDPs might alert the dope on the street that one, the data that governments put out is a ruse, and two, the dopes on the street really can’t live as lavishly as they hoped. And three, government can’t bring economic utopia to the masses without bankrupting the rich people. Reality bites! Truth burns the soul of fantasy lovers. So here is the truth. A falling money velocity (bad economy) can be offset by a rising money supply (the deception) so that the GDP can rise (the con). The end result is that sovereign debt must increase as an excuse to inject more currency. A depreciating currency spikes inflation. Inflation pushes prices higher for everything including stocks. Yippee! Food prices are up. Insurance rates are up. Cable prices are up. The currency buys less and less. Stock prices are up. Yippee!! How insane are we? How much manipulation is there? I would like to answer both questions with a chart of Intel. Intel makes chips that go into PCs. PC makers are struggling to keep the doors open. It makes sense that Intel would suffer along with PC makers. So, let’s look at Intel on a two-day basis on the day they announced earnings, January 17 after the NYSE close and the day after. The chart below shows the action for every two minutes of trading. Take a look at the end of the day in the last five minutes of trading on the 17th. Everyone knew earnings would come at the close of trading. Everyone knew PC sales were very slow. Yet, Intel’s stock price moved higher at the open of trading. At the very end of the day, some selling began to pull the stock price down. Suddenly, at 3:54 PM a massive buy program (as evidenced by massive volume at the bottom of the chart) jolted the price higher. Who in their right mind would have been buying this stock with such conviction? Maybe someone who wanted to ensure stock gains for the day. Intel is, after all, a Dow stock. At 3:58, a strong sell program took advantage of the higher price afforded by the previous two minutes of trading. The exchanges closed for the day. Intel announced their earning results. They were terrible. The next morning, the stock price caved in. Who could have guessed? More importantly, who was manipulating the price of Intel higher at the end of the day on the 17th? I refuse to believe that anybody was stupid enough to think that Intel would report good earnings. But give the Fed some time. They will have Intel higher by next week. The indices will comply and follow. Yippee! Enslavement is enslavement. Only the Fed uses velvet shackles. Most likely, the stock indices will rise until the realization that the US is broke and must again raise its debt ceiling. Until then, enjoy!